Nobody wants to find a bandage in their food. That''s why chefs use bright bandages like these Foodie Bandages that are easy to spot if they fall into an order of risotto! 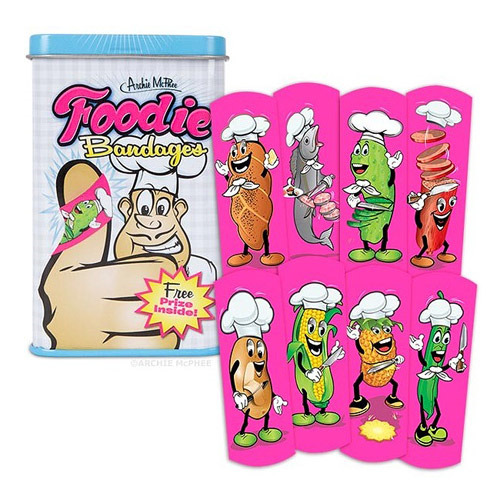 This set of 15 large, 3-inches long x 1-inch wide assorted sterile bandages is not only bright neon pink, but also decorated with images of personified food slicing themselves while smiling. Each tin comes with a free prize inside, too! Comes in a 3 3/4-inch tall metal tin. Latex-free adhesive. Each bandage measures about 3-inches long x 1-inch wide.